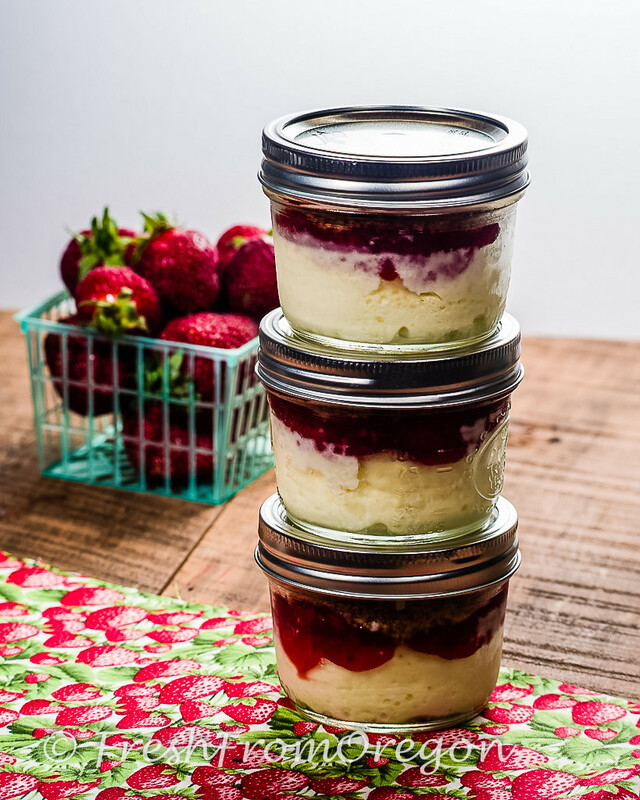 Easy single-serving cheesecake desserts are baked in a glass jar and there is no slicing and serving just pick up a jar and enjoy! 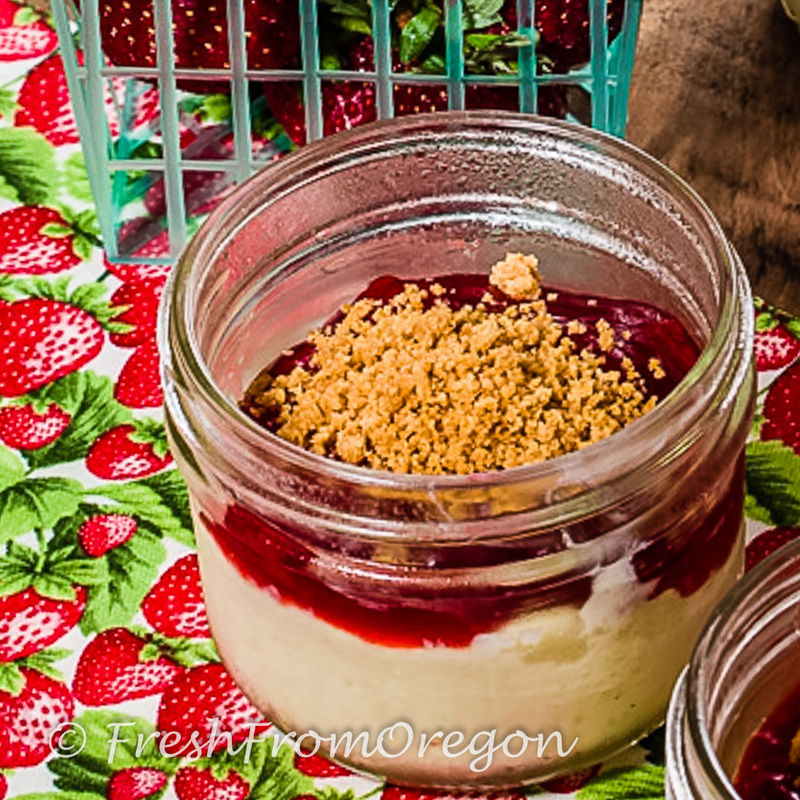 With layers of creamy cheesecake, homemade strawberry sauce and topped with toasted graham cracker crumb you will not put your spoon down until it is gone. 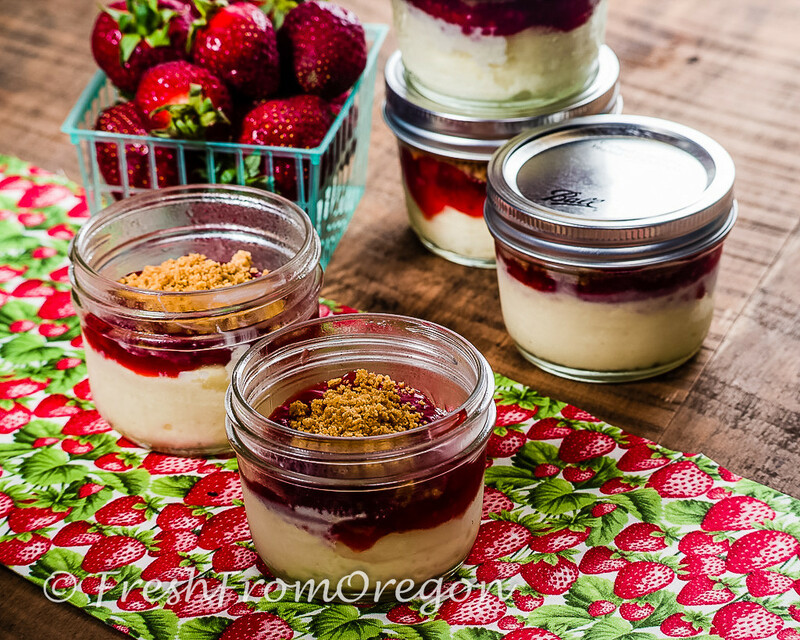 These are great to make ahead and perfect for a picnic, birthday party, or any kind of gathering! Preheat oven to 325 degrees. To make the cheesecakes beat cream cheese with a mixer on medium speed until smooth. Add sugar and beat on medium speed for 3 minutes more. Reduce speed to low. Add eggs, 1 at a time, beating well after each addition. Raise speed to medium. Add sour cream, lemon juice, and salt. Beat for 3 minutes. Divide batter among five 8-ounce canning jars, filling each two-thirds full. Transfer jars to a deep baking dish; add enough boiling water to dish to reach halfway up the sides of the jars. Cover dish with foil; cut 8 slits into top to vent. Bake until set in the center, about 25-30 minutes. Let cool. Place lid and ring on jars and refrigerate overnight to set. Meanwhile, make the graham topping: Stir together graham-cracker crumbs and butter. Bake on a parchment-lined baking sheet for 10 minutes. Let cool. Store in air tight container until ready to assemble. To assemble top each cheesecake with 2 tablespoons strawberry sauce and divide the graham cracker topping among jars (about 1 heaping tablespoon each). Ready to eat or place on a lid and refrigerate for later!